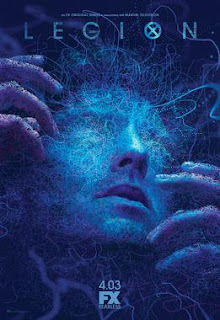 When Legion first came out it was such a strikingly different television experience versus other shows, regardless of them having a superhero slant or not. But Legion is unlike anything else we've seen and it's one of the more creative storytelling ventures that we've seen in a while. This second season only continues to push the boundaries on what "should" or "shouldn't" be done with television as it has managed to build on the sort of visual language it had established in the first season. And it also manages to take some major steps towards better aligning the titular character Legion with his comic book counterpart. I love this show a heck of a lot and I'm admittedly quite worried that it's not going to last long as it isn't designed with more mass market sensibilities in mind. But while it's around it remains to be a show worth celebrating given all the craziness it embraces as part of its core narrative structure. Synopsis: Legion is a American drama series created by Noah Hawley for FX. The show is based around the character Legion from Marvel's X-Men comic books and the show has been confirmed for a third season. The season skips forward a year after the Shadow King escaped in the body of Oliver Bird (Jemaine Clement). There's also the matter of David Haller (Dan Stevens) having been kidnapped by a mysterious sphere at the end of the first season and finally appearing in a nightclub without any memory of what had passed in-between. But the main mission is to find the Shadow King's original body as Amahl Farouk (Navid Negahban) before he does as this would further heighten his already potent mental abilities should it come to pass. On top of all this, Shadow King has also managed to spread some sort of mental virus that leaves affected individuals in a catatonic state where they continually chatter their teeth. And as the folks at Division 3 puzzle over the gap in David's memory, he in turn receives an unusual vision or message from a supposedly future incarnation of Syd (Rachel Keller) who tells David that he needs to actually help Farouk find his body. What I Liked: Dancing and music have always been a big part of the show and this season is no different in embracing the use of dance and physical movement to more visually depict the mental struggles between different characters. They could have gone down the route of paying for big special effects sequences to create the usual wireframe projections of these psychic characters fighting one another. Instead we had so many different depictions of mental conflict with the best being the dance battle that helped kick off the season. The show continued to employ the occasional lecture piece as a sort of framing device that at first felt very tertiary to everything but actually had more in-story significance later in the season. It just goes to stress how everything put into the show is there for a reason and with very deliberate purpose. It just always apparent why this is so but once the pieces come together in the end it all comes out quite wonderfully. What Could Have Been Better: As much as Division 3 is dedicated to stopping Shadow King in this season, they don't seem to be very good at their job apart from leaning heavily on David. A lot of the season has them lost in more internal stories of a sort and that just delays things from getting to where they need to be sooner. It's a minor complaint in the greater narrative scheme of things but it does make you wonder at times. I also felt that the Cary/Kerry (Bill Irwin/Amber Midthunder) dynamic wasn't as well utilized in this season versus the first one. There was the twist introduced about their shared lives but it didn't seem to really go anywhere. The same goes for what was done to Melanie (Jean Smart) shunted to the background for most of the season with her only really coming back into play towards the end of things. I get that they had to shift the narrative to focus on David a heck of a lot more and they gave a lot of screen time to Farouk as well but other characters really had to pay the price. TL;DR: Legion continues to be an amazing, inspiring show that is both visually beautiful and narratively fulfilling. It's not the easiest show to love but once you go down the rabbit hole the end experience is more than worth it. Thus the second season gets a full 5 crazy dance sequences out of a possible 5.